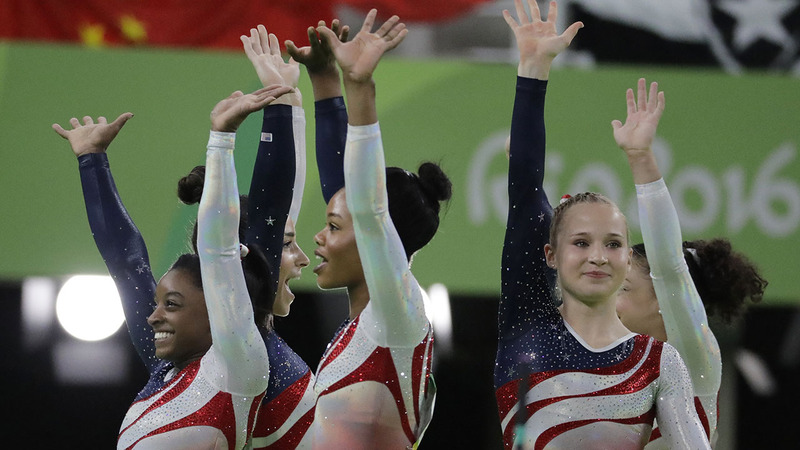 It didn't matter that the U.S. women's Olympic gymnastics team had already sewn up the team gold by the time three-time world champion Simone Biles saluted the floor exercise judges during the final event on Tuesday night. Winning isn't enough for Karolyi. Never has been. For 90 seconds the longtime national team coordinator leaned one way and then another, following Biles' every move. Only after Biles' score was posted - one that served as an exclamation point on two hours of nearly flawless gymnastics - did the architect of a dynasty relax. The U.S. posted a score of 184.897, more than eight points clear of silver medalist Russia and nearly nine more than bronze medalist China while winning its second straight Olympic title and third overall, a margin greater than the one that propelled the "Fierce Five" to victory in London four years ago. "It's perfect," Biles said. "It's Martha's last year. We wanted it to be meaningful." It's a fate the rest of the field seemed to accept. Russian star Aliya Mustafina admitted before the competition the Americans were "unbeatable." China's Shang Chunsong said her team "aimed for the silver medal," a position the Chinese seemed to have in hand until stumbling on the final rotation. The top spot was never in doubt. The U.S. hasn't lost a major international competition since 2010 and there appears to be no end in sight to their run even though Karolyi and her husband Bela are selling the training facility on their Texas ranch to USA Gymnastics later this month.